Chocolate Covered Strawberry Goat Whey 1 lbs. Vanilla Goat Whey 1 lbs. Strawberry Goat Whey 1 lbs. Banana Foster Goat Whey 1 lbs. 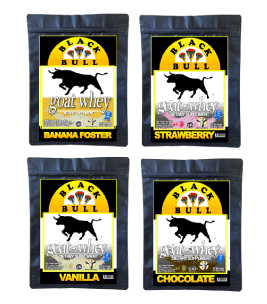 Banana Foster Goat Whey 2.2 lbs. Strawberry Goat Whey 2.2 lbs. Vanilla Goat Whey 2.2 lbs. Chocolate Goat Whey 2.2 Lbs.